Howlin' Wolf Records: SIX STRINGS: FINAL GIRLS! I would compare FINAL GIRLS to THE LAST ACTION HERO but that might infer some negative connotations to the film. I can't deny that FINAL GIRLS does have a similar concept of people getting trapped in a movie through the magic of cinema. Instead of getting stuck in JACK SLATER part IV starring Arnold Schwarzenegger, our protagonists find themselves in a slasher flick from the 80's titled CAMP BLOODBATH having to battle a Jason Vorhees type slasher named Billy Murphy. Both are highly imaginative but LAST ACTION falters by being too zany with the concept adding an out of place cartoon cat that is a detective and having that annoying kid from PREHYSTERIA as the lead actor. 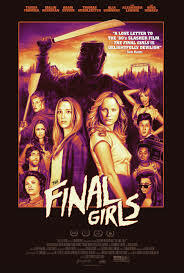 FINAL GIRLS does a better job with the concept. It manages to stay on the line between between horror and comedy to deliver a sincere heartfelt drama that is surprisingly effective. THE NEON DEAD is worth a look!